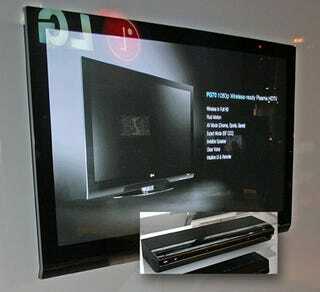 Blasting HDTV from one place to another without wires is a revolutionary concept that made evolutionary strides at CES 2008. We found numerous companies showing the technology that's able to move luscious HDTV video either across the room, or in some instances, through walls and around the house. LG will offer wireless 1080p as an option on its 50-inch and 60-inch PG70 plasma screens, and it'll be standard on the LG71 LCD panel. Using the 802.11n protocol, the video is compressed with JPEG 2000, and looked nearly perfect with few visible artifacts. All these models will ship in August. Westinghouse Digital's wireless 1080p system uses UWB (ultra wideband) components from Pulse-LINK, building the receiver into its TVs and using (nearly) visually lossless JPEG 2000 compression to make it all possible. Available in Q4, the company says it'll add $200 to the price of a 1080p LCD TV. Gefen's UWB-based wireless HD system was the closest to a shipping product we saw, albeit capable of only 1080i/720p transmission. The $700 system is in the final stages of approval and the company says it will ship "in a couple of weeks." Belkin's wireless 1080p product uses 5.8GHz RF (radio frequency) tech by Amimon that we saw demonstrated at last year's CES, transmitted by this cool-looking box to a receiver mounted on the back of the TV that can be between 50 and 100 feet away. It'll be available in September for around $600. Panasonic's Viera Link Wireless HD sends a beam from transmitter to receiver using 60GHz RF. If someone gets in the way of that signal, its "beam steering technology" bounces the beam around to get it there anyway. Seems to act like infrared, although they told us it's radio frequency. Looks great, but they had the works hidden in a big, clunky cabinet. Seems pretty far from commercial rollout. Sony's wireless in-room HD also used Amimon technology for its demo, where booth reps were careful to call it a conceptual idea. While Sony had a snazzy-looking transmitter box (seen at the bottom of the pic above) in view, the guy admitted that the real workings were concealed in the cabinet below. The video quality of the 1080p was nearly perfect, with almost no latency, a hallmark of the Amimon system that's been working well since a year ago. Sony wouldn't say when or if the tech would be brought to market. In another demo around the corner, Sony showed us its 720p/1080i wireless HD system (transmitter picture in inset above), compressing the video with a few artifacts and a three-second latency, but able to transmit the signal 100-300 feet. This version also had a backchannel for remote commands to be sent back to the transmitter. Summing up, hold off with that sledgehammer you're about to use to smash the drywall to install HDMI cable for your home theater projector. It looks like practical and affordable wireless 1080p will be the Next Big Thing, and we expect it to be shipping from numerous manufacturers using a variety of tech by next year's CES. Before long, according to tech driver Amimon, economies of scale will allow the technology to be built into components at little extra cost.